Learn how to make your organization’s mobile devices secure and compliant. 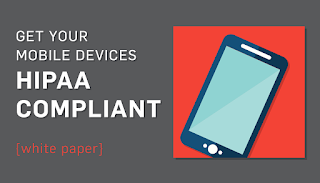 Read the white paper 5 Tips for HIPAA Compliant Mobile Devices. The rise of mobile devices in healthcare organizations generally means more convenience in the workplace. Mobile devices can help doctors work more quickly, process information faster, and simplify paperwork. Unfortunately, mobile devices can present problems in data security for healthcare organizations. If not secured properly, data can easily be stolen from mobile devices. Without proper security protocols, you could lose sensitive data from your employees’ phones and tablets. Does that mean you should not use mobile devices? Not necessarily. You just need to take the right security precautions when introducing mobile devices into your organization. What’s so risky about using mobile devices in healthcare? Well, they generally don’t have as many security protocols in place as computers, such as firewalls, encryption, or antivirus software. Fortunately, these risks can be addressed; it just takes a few procedures and policies. Here are some tips to securing your mobile devices. These practices can keep your mobile devices from getting infected by malware and prevent possible breaches as long as your employees are trained on these subjects from your policies and procedures. HIPAA requires healthcare entities to encrypt electronic protected health information (PHI). All PHI that’s sorted or transmitted in systems and work devices must be encrypted. This includes mobile devices as well. If you backup your mobile device on your hard drive, make sure the backups are encrypted as well. Keep in mind that most mobile encryption services aren’t as secure as other devices because most mobile devices aren’t equipped with the most secure encryption. Mobile technology is only as secure as a device’s passcode. A four-digit passcode can be easily cracked with the right tools. Choosing a passcode with at least 8 characters and having the device lock out after a number of attempts will help you make breaking into your phone a little trickier. The ideal passcode has eight characters or more, contains alphanumeric and special characters, and doesn’t contain dictionary words (e.g., Ilovefootball1 is no good). Older operating systems and app versions tend to have errors that make them vulnerable to possible data attacks. Just like computers, mobile devices need to be patched often to eliminate vulnerabilities. It’s important to update each app installed on devices. It only takes one faulty app to introduce malware to your device, putting your data at risk. Fortunately, updating mobile device software is fairly simple and doesn’t take much time. Avoid suspicious emails: phishing email scams are big gateways to malware and data breaches. Make sure your employees can recognize phishing email scams. Be careful with internet usage: going onto non-secure websites and using non-secure Wi-Fi could download malware into your mobile devices. Be careful with texting: phishing scams often target texting and phoning. Train your employees to recognize phishing texts. Need help in training your workforce? Talk with us! It’s up to you to make sure your mobile devices aren’t responsible for a data breach. By following basic security practices and policies, you can make your devices HIPAA compliant and keep your data safe. Want to know more about securing your organization’s mobile devices? 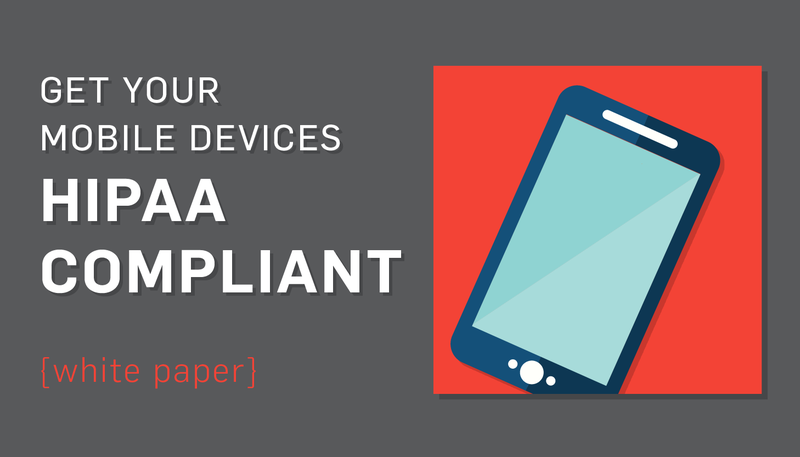 Read our white paper 5 Tips for HIPAA Compliant Mobile Devices.